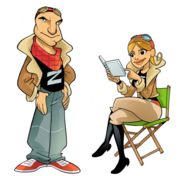 Juliet and Zulu are both Master Flight Instructors. They will guide you through this book which is an essential reference summarizing the basic knowledge used by Private Pilots to fly under visual flight rules (VFR) worldwide. It is written not only for Private Pilots, Sport Pilots and flight students, but for everyone who is interested in learning about flying an airplane. It also serves as a convenient reference for licensed pilots who need to stay current. Juliet and Zulu have designed this Quick Reference to explain complicated concepts in a logical way which will make learning straightforward and as easy as possible for the reader who is encountering the material for the first time. Concepts which are thoroughly understood, rather than just memorized, are much easier to apply in practice and to retain. The light hearted, jargon free, approach is intended to make the knowledge less formidable and to make the presentation attractive to younger readers and to the non pilot. The material is condensed and organized so that a substantial amount of information is contained in just a few pages making it easy to find and review specific items. For more detail and much more extensive explanation, the reader is referred to the several excellent and very well written Federal Aviation Administration (FAA) publications covering similar topics. The Aircraft Owners and Pilots Association (AOPA) has excellent instructional material on its website www.AOPA.org. The book is formatted in ePub which works on the Apple iPad and on almost every other tablet reader. It is also available in the PDF format for use on a computer and on most tablet readers. You can purchase the ePub version from the Apple iBookstore, and either the ePub or the PDF from most major online bookstores, or directly from me. Because the book contains many color graphics, it does not display well on cellphones or smaller reading devices. Either version can be downloaded for US $5.99 (or the equivalent in other currencies) by clicking on the appropriate text or link in one of the two boxes shown at the bottom left of this page. A print version is in process and will be available through this website when it is published. © 2007 PilotZulu Corporation, revised 2010. Copyright claimed exclusive of U S Government graphics.